CROCK POT ALL IN ONE SPAGHETTI, GARLIC BREAD, ROMAINE SALAD WITH HOMEMADE CROUTONS | Cook, Party, Enjoy! It’s a beautiful day and we are off to the pool for the day. I was concerned about dinner but remembered I could make this delicious crockpot spaghetti. Saved again by my crockpot. Just in case you need a dinner that pretty much makes itself here ya go. I included my recipe for homemade Good Season’s Italian Salad dressing and homemade croutons. Hope you try them. No preservatives or other added whatever. 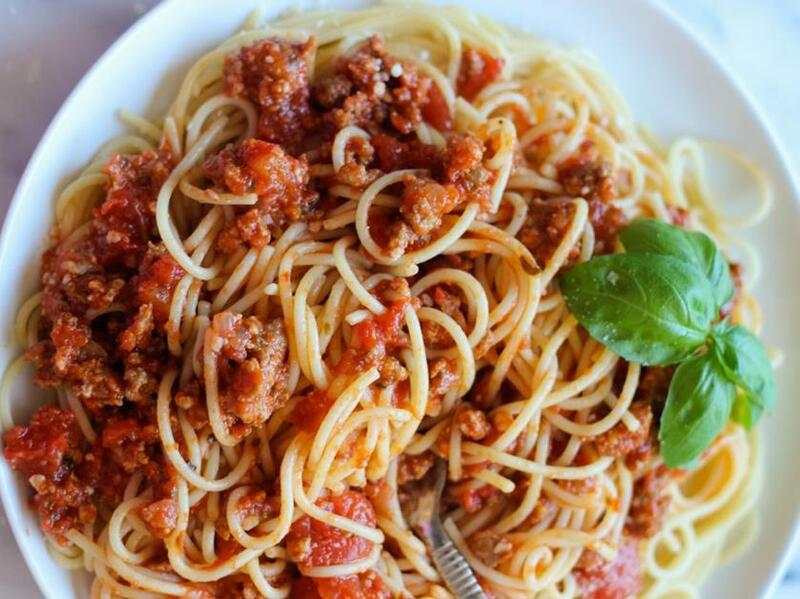 No Fuss – Crockpot Spaghetti. Create savory spaghetti in your slow cooker/crockpot. Add a loaf of garlic bread and a romaine salad and you have dinner tonight. In a large skillet brown ground beef and drain. Combine browned beef, tomatoes, water, mushrooms, onion and seasonings and pour all ingredients into your 5-qt. slow cooker/crockpot. One hour before serving, stir in dried spaghetti. Cover and cook on high 1 hour longer or until the spaghetti is tender. To serve: Spoon portions into individual bowls and top with shredded mozzarella and sprinkle with parmesan/Romano grated cheese. Add a loaf of garlic bread and a Romaine lettuce salad. Use mixer and mix butter, garlic, parsley, and cheese until well blended just like you would if you were making compound butter. Spread garlic butter mixture lightly on both sides of each slice. BAKE in 400° oven for 10 minutes until heated through open up foil and allow to bake additional 2-3 minutes to crisp outer crust. Wash lettuce and spin in your salad spinner to dry. Tear lettuce into small bite size pieces. (Truthfully I cut my lettuce for salads because we are going to eat it right then so there is no time for rust to form so using a knife doesn’t matter and it is so much easier) Put the lettuce into your serving bowl. Using a mandoline, or other slicer or a sharp knife slice the onion into thin slices. I slice my cherry tomatoes because I feel it makes them easier to enjoy. I am not a fan of biting into a small tomato and having it explode in my mouth. Slice the cucumber pretty thin. Did you know the seeds of the cucumbers are what causes gas so I will slice my cucumbers horizontally in half and then using a spoon I scrape out all the seeds before I slice it. Toss your salad ingredients in a large bowl and serve from the bowl or serve in individual salad bowls. 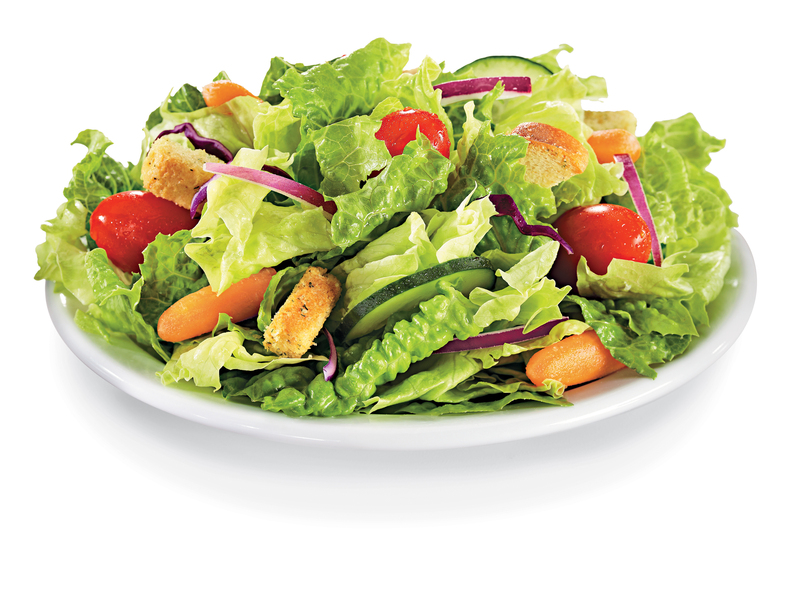 If you like your salad a little wilted you can add the dressing in advance or provide the dressing at the table for people to add the amount they want. TIP: Romaine lettuce provides so many more nutrients than iceberg lettuce and it really tastes good. It is not bitter as some people think. It has always been associated more with Ceasar Salad but I use often for most of my salads. If you really are pressed for time use a storebought package of pre-made romaine salad or the spring mix but be sure to wash in your salad spinner even if it says pre-washed. Copycat (Good Seasons) Italian Salad Dressing I love Good Seasons dressing. I use it for everything from dressing salads to marinating meat. I wanted a way to make it with my own ingredients to avoid any extra ingredients like the thickener and preservatives. After searching high and low I found a few different copycat recipes and through trial and error came up with this one. Best done in your blender. Pour into your blender onion, garlic, salt, sugar, pepper flakes, black pepper, mustard, paprika and celery seed until ground very fine. add oil; shake well again. 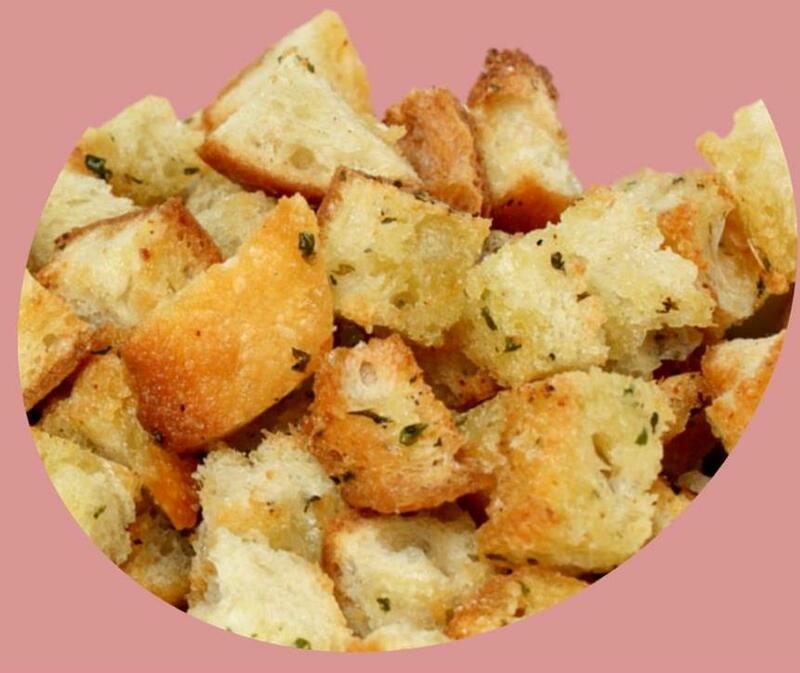 Making croutons is very easy. While bread is still whole, using a pastry brush (I prefer the silicone brushes) brush both sides of the bread with the oil. Combine the seasonings and sprinkle over the bread slices sprinkling on both sides. If making cheesy croutons sprinkle with Parmesan/Romano grated cheese on both sides. Cube bread while still frozen into desired size and spread in single layer onto a cookie sheet or stone. Bake at 350 degrees for twenty minutes. Allow to cool. Place in an airtight container and these can be stored for up to weeks in this container. –Alternate coating method. Cube the bread while still frozen. In a large bowl combine the oil, and seasoning and mix well. Toss the bread cubes into the bowl and stir the cubes until all the cubes are coated. If making cheesy croutons sprinkle Parmesan/Romano onto the cubes and toss. As above spread out on a cookie sheet or stone and bake at 350 degrees for twenty minutes and allow to cool. Store in airtight container. Shelf life about a week. 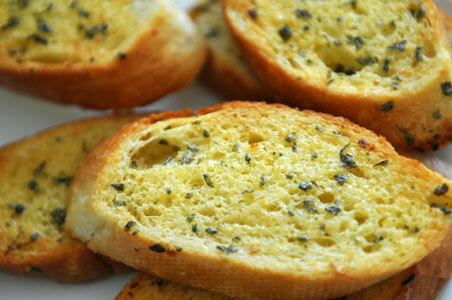 TIP: Frozen bread is the secret to easy cutting of the bread into crouton size pieces. I typically will keep a large zip lock bag in my freezer and as bread is left over I will put it in this bag to keep until I make croutons. …at the pool all day and still enjoying a dinner as good if not better than Olive Garden, he:) he:) he:) except of course that creamy, delicious raspberry cheesecake…oh wait I have that recipe, maybe next time.